Disk Cleanup is a handy system utility that is built-in to Windows. It can be used to delete temporary files, some logs, the Recycle Bin, and previous Windows installations. The latter is extremely useful, as it allows you to free up Gigabytes of disk space after upgrades. Windows keeps a copy of the previous version of Windows on the disk after upgrades to provide rollback functionality. 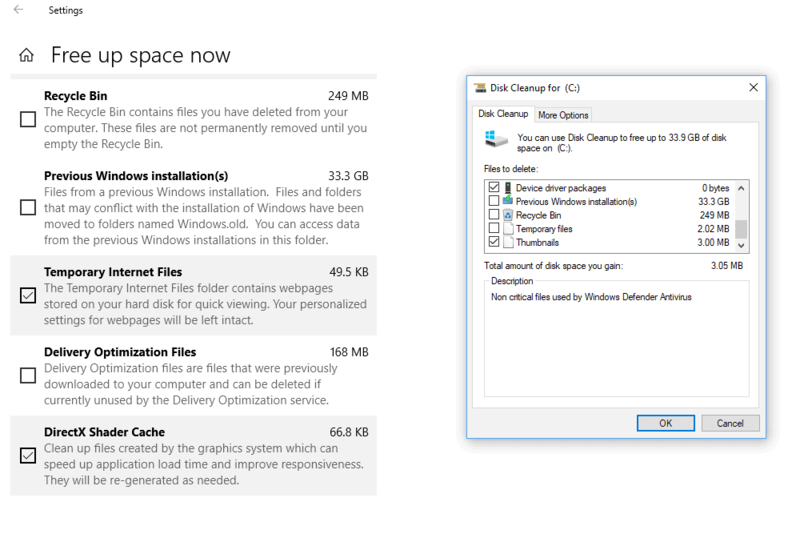 Microsoft introduced the Disk Cleanup tool in Windows 7. Disk Cleanup was never as good at freeing up disk space than third-party solutions such as CCleaner, but the built-in nature of the tool made it useful in situations where third-party programs cannot be used. Windows 10 Version 1803, the Spring Creators Update version of the operating system, comes with a new "free up space now" option in the Settings application that replicates the functionality of Disk Cleanup. Activate "free up space now" on the page. The utility runs a scan when you open it and displays its findings in the interface. This works similarly to how Disk Cleanup handles this but with the difference that system files such as previous Windows installations are included by default. Tip: You can run Disk Cleanup in clean up system files mode automatically as well. Some file locations are selected by default, others are not. The list of locations and descriptions appear to be identical for all supported file locations. A minor difference between both tools is that Free up disk space omits locations with 0 bytes. Disk Cleanup is still part of Windows 10 version 1803. You can run it just like before, and use it or the Settings application. Microsoft revealed back when it released Windows 10 that it had plans to move all Control Panel items to the Settings application, and that it wanted to migrate tools to Settings as well. The process is still ongoing and if the company keeps the current pace, it will probably take a decade or more before all Control Panel items are moved to the Settings app. As for Disk Cleanup, it is unclear if Microsoft plans to remove the program from Windows 10. Considering that it moved the functionality to the Settings app in the Spring Creators Update, it seems likely that this is going to be the case. Now You: Do you use Disk Cleanup or third-party tools? Personally, I keep such a tidy and well organised PC, that I would very rarely – if ever – need an external or even a built-in tool to perform that. I know where everything is, and everything has a purpose. Sorry, Sophie. MS doesn’t clean up after itself very well will dirty things up on its own during many operations. Occasional maintenance is good. The Disk Cleanup utility was introduced in Windows 98, not Windows 7. I recently noticed that Edge doesn’t delete cookies (since v1709?) despite the options available in its settings, CCleaner can’t do that either and in addition, adds cookies from Avast! CTRL+SHIFT+DEL in your browser should delete the cookies. Just make sure the appropriate box is ticked. Microsoft turned it into Android looking UI lol. I agree except its worse since it’s all monochrome and spaced out. gHacks is pulling a Twitter stunt lol. I frequently see that stuff happening on Twitter. For example, a tweet shows it has 7 likes but there are only 3 showing. Or there are 2 likes but none showing. It was there long before Windows 7. I think Disk Cleanup came about in Windows 98. Not bad, but it doesn’t look powerful enough tocreplace 3rd party cleaners. Sure the old Disc Cleanup could clean old installations, but if I understand this correctly, it’s the Windows.old folder on C:\, then it can be deleted manually. No. If you try to delete it manually you will get an error. I manually deleted Windows.old last year, I think after 1803 was installed. After a little more than a month it was still there so I deleted it. I had read comments like yours, but it worked for me. Maybe it won’t work all the time–I don’t know. If it doesn’t work I assume it can be cleaned in Disk Cleanup since there’s something there that I assume is Windows.old. Honestly I think there are better things they could be spending their time on rather than replicating already available features. Can the new Settings page do this? Really awful layout. The old disk clean up looks million times better compared to this modern trash. Disk Cleanup, reboot, then an old util called CleanUp 4.52 keeps things nice and clean. Just run CleanUp in demo mode first.